Xiaobing Wu/Contributing Photographer Art history faculty and graduate students gather in the Visual Resources Center for professor Tom McDonough’s VizCult talk. 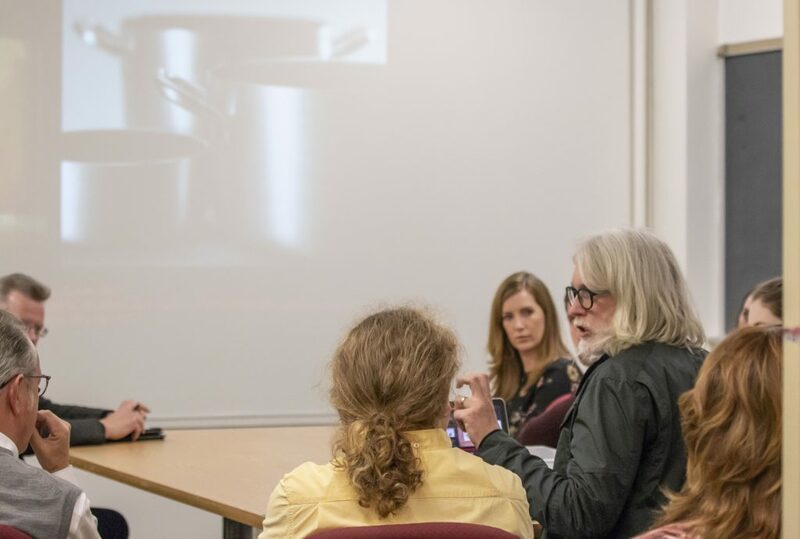 On Wednesday evening, Thomas McDonough, associate professor of art history, gave a paper titled “The Gestus of Things” for The Harpur College Dean’s Workshop on Visual Culture (VizCult). His research was presented at the Visual Resources Center to an audience comprising Harpur College faculty, graduate and undergraduate students. “This is a concept in the radical playwright’s theatrical system … succinctly defined as the socially significant language of a body’s carriage, posture or attitude, what one scholar aptly calls a hieroglyph or ideogram read from a human body,” McDonough said. McDonough’s research primarily centered on the oeuvre of American artist Christopher Williams, whose work mainly lies within photography. To illustrate the gestural and theatrical aspects of Williams’ work, McDonough examines the consumerist photographs of Zoe Leonard and portraits from Thomas Ruff, in addition to the Brechtian influences. Within the art history department, graduate students are encouraged to attend the discussions because VizCult can offer a clearer picture of what is expected when presenting research at conferences. VizCult also opens up a setting of discussion for faculty; most of the papers presented in the series are in-the-works and face criticism from the art history department prior to publication in journals or presentation at other conferences.